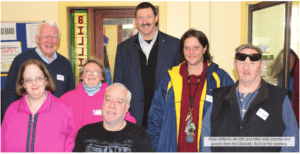 Snowy’s Place, a social café in Cooma that provides meals, good conversation and a sense of belonging for many people in the community, is now open. Ross Williams from Reaching Out Foundation was the driving force behind this new cafe, and we are so proud to assist with funding for the kitchen fit out. This is a great result for Cooma! Snowy’s Place is the 4th community social café Ross has helped open. About 40 people turned out to help launch the cafe on its first day. A very large group of community organisations and local businesses are helping with many aspects of Snowy’s Place, including assisting with staffing and volunteers and donating food and supplies. It is wonderful to see the community support for this new restaurant which helps people in the community find a sense of belonging when they need it most. While many people don’t consider the impact loneliness can have on different communities and age groups, social cafes are an integral part of helping people find meaningful interaction with others. Other social cafes have reported that people who attend develop a sense of worthiness and belonging that has been missing from their lives for a variety of reasons. They attract people who may not have the opportunity to talk to others, except for the time they spend at the cafe, and who may not feel that they are regularly treated with the kindness they receive at a social cafe. These positive interactions have a profound effect on the wellness of a community, and some of its most vulnerable members. We are proud to support this in Cooma! Many thanks to The Monaro Post for allowing us to use their photo from the Snowy’s Place opening event.